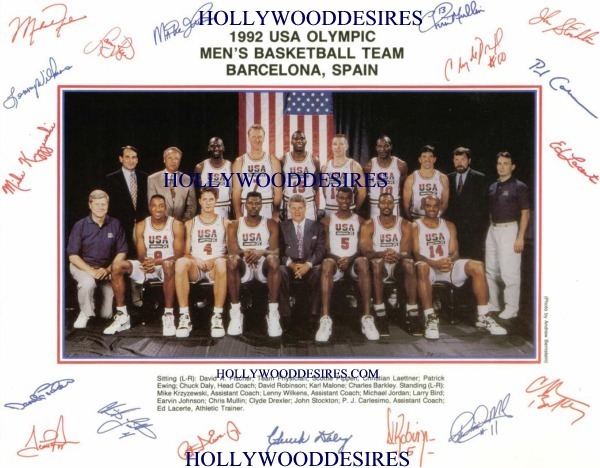 Excellent professional autographed picture of 1992 USA OLYMPIC DREAM TEAM (SCOTTIE PIPPEN, CHRISTIAN LAETTNER, PATRICK EWING, CHUCK DALY, DAVID ROBINSON, KARL MALONE, CHARLES BARKLEY, MICHAEL JORDAN, LARRY BIRD, EARVIN JOHNSON, CHRIS MULLIN, CLYDE DREXLER, JOHN STOCKTON plus coaches and team physician). This professionally printed photo is of fantastic quality, high clarity and ready for framing. Autographs of all are preprinted within the glossy 8x10 and shipped very secure, waterproof with a clear firm plastic photo protector and includes a certificate and guarantee. Makes a great gift. Price includes shipping.